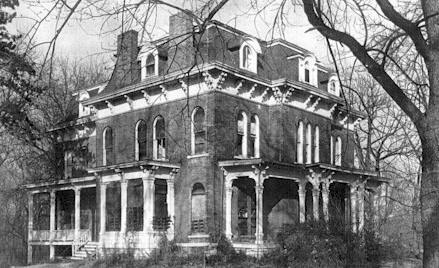 When just about any native of the Alton area thinks of a haunted house, normally one name comes to mind - the infamous McPike Mansion on Alby Street. 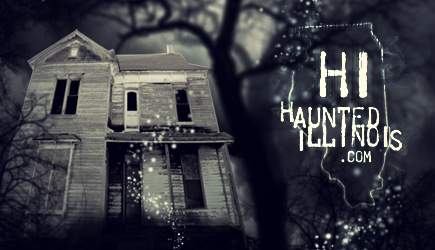 As I am NOT a native of Alton, I was allowed to have some doubts about the authenticity of the reported hauntings here. However, even as I began to dismiss the fanciful tales of so-called "psychics" and the breathless stories of vandals and curiosity-seekers, I was overwhelmed with accounts of strange encounters in the house. Many of them came from people with no reason to lie, reliable witnesses and ghost researchers who had gone to the house expecting to find anything but ghosts! What they found is another question altogether, but simply based on the number of stories that swirled about the place, it was soon obvious that I could not refer to the McPike Mansion as anything other than one of the most haunted houses in the city of Alton. As with many other "haunted houses" though, not many people know the history behind this once grand structure. The house was built in 1869 for Henry Guest McPike. The McPike family can be traced back to Scotland and Henry McPike's ancestry includes a number of patriots who fought during the Revolutionary War, including Captain Mose Guest McPike, of New Jersey, and Captain James McPike, both of whom were at Valley Forge with George Washington. James McPike came west to Kentucky in 1795, bringing with him his sons, John and Richard. Henry McPike was a son of John McPike and came to Alton as a very young man in 1847. McPike soon became active in the business and political community of Alton and over a period of years was involved in a number of different companies, working as a real estate agent, box manufacturer, and insurance executive, along with other things. He also became the president of the oldest horticultural society in Illinois. His political aspirations did not get off to a quick start however, although he did have an interest in the abolitionist movement. His father had been the editor of a Whig newspaper (the Whig party later became the Republicans in the time of Abraham Lincoln) and was an early advocate of the abolition of slavery. Despite this, McPike never sought political office, although it was offered to him many times. During the Civil War, he was called upon to act as Deputy Provost Marshall of the District and this placed him in a management position in the War Department. After this, he was said to have begun acting as a representative in many conventions and with the city council. This would eventually lead to a stint as the Mayor of Alton from 1887 to 1891. The McPike Mansion was constructed in an Italianate-Victorian style and stands as one of the more elaborate homes in Alton. It contains 16 rooms and a vaulted wine cellar and was originally built on a country estate of fifteen acres that McPike called "Mt. Lookout". Thanks to McPike's interest in all things horticultural, the estate was planted with rare trees and shrubs, orchards, flowers and extensive vineyards. The owner became the propagator of the McPike grape, which became known across the country. There is no question that this was one of the most beautiful homes in the area. The McPike family lived on at the estate for some time after the death of Henry McPike, but records are unclear about some of the dates. It has been stated that they stayed in the house until around 1936, while others records say that the home was owned by Paul A. Laichinger, who purchased the house in 1908 and lived there until his death around 1930. Laichinger either lived in the house or rented it out to tenants. Despite some inaccuracies about dates, the house has since been listed in the National Register of Historic Places. However, it has also been listed on another, not so prestigious list... the Landmarks Preservation Council of Illinois' list of the 10 most endangered historic places in the state! The years have not been kind to the McPike Mansion and has been abandoned and in disrepair since the 1950's. Since that time, weather and vandals have caused some pretty major damage to the structure. The house once had a number of marble fireplaces and some very extravagant woodwork, but all of that was stolen during the time it was unoccupied. Windows have been broken, plaster cracked and destroyed, floors have deteriorated to the point they are not safe to walk on, and worse. The place is in desperate need of repair but the enormous price tag makes this a daunting task. Estimates for the roof alone reach up to around $50,000! But some hope does remain that the McPike Mansion will not become just a memory. In 1994, Sharyn and George Luedke purchased the house at auction. As of this writing, they are continuing their efforts to restore the home and turn it into a bed and breakfast or a historical attraction. It has been an uphill battle, but they have continued trying to bring attention to the house as a historical site with tours and outings. Sharyn Luedke also believes the house is haunted. Her unusual encounters at the house carry much more weight, given the time she has spent there, than the claims of trespassers, so-called psychics and curiosity-seekers who come to the house simply because it looks haunted. There have been hundreds of stories which have circulated about the mansion, from the chilling to the downright silly, but Sharyn's claims that the ghost of Paul Laichinger haunts the place seem to be the most credible. He is one of the few spirits who is alleged to haunt the place for which a real historical connection exists. Sharyn says that she had her first encounter with Laichinger's ghost about six weeks after she bought the house. She was on the property watering some plants and saw a man standing in the window, looking out toward where she was standing in the front yard. A chill came over her but she noted that the man, who vanished, was wearing a striped shirt and a tie. Sharyn has a photograph of Paul Laichinger wearing an identical outfit. Another spirit in the house is thought to be a domestic servant that Sharyn named Sarah. She was little more than a presence with an assumed name until a man came by the house one day and presented the Luedke's with some books that he had removed from the house 17 years before. One of the books had the name "Sarah Wells" written inside of it. Since that time, Sharyn has been touched (actually hugged) by this spirit and she and her husband have occasionally caught the scent of lilac on the third floor. As mentioned, there have been hundreds of stories told about this house and there are those who claim that a legion of spirits still haunt the place. The main problem with taking these stories too seriously involves the fact that his house was locally regarded as the "neighborhood haunted house" for years and was a place where teenagers would come to hang out and party. In more recent times, the claims of mediums and attention-seekers has further muddied the waters. And while I am not convinced that all of the local stories are true... there is more here than meets the eye. I have been lucky enough to take part in some paranormal investigations at the mansion that have left many of us scratching our heads and have also seen some video footage that was filmed in the basement that remains unexplained. One investigation managed to pick up a curious event that is worthy of mention. While the entire group was gathered in the wine cellar of the house (a step down below the basement) one of the group members became uncomfortable in the small, enclosed space and asked to go upstairs. She was accompanied upstairs by another woman who was present and soon the group in the cellar was waiting patiently for her to return. After a few moments, the sound of the second woman's footsteps could be heard descending the steps, descending the basement stairs and then crossing the basement floor. The steps were followed by short pause and then the metal door to the wine cellar opened, scraping across the stone floor as it did so. One problem though - there was no one there! Both of the women who had left were still upstairs and no one had come down the steps? The entire strange incident was captured on video tape! 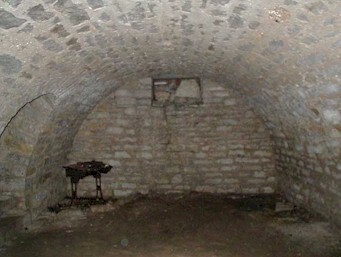 The McPike Mansion's Infamous Wine Cellar. For now, I will leave you with that and allow the reader to be the judge of the authenticity of the events here for themselves. Don't be as quick to judge as I originally was though - a visit to the house just might reveal that there is more here than first meets the eye!